Don't panic, even the new Windows 10 has a fax and scan function to scan a page on the fly as a document and send as a fax! You don't must use external a software such as ... WinScan2PDF for a easy scan! The quickest way to open the windows fax and scan software is with the command WFS, stands for (Windows Fax Scan) on MS all OS, also on the new Windows 10 whether desktop, tablet PC or Surface Pro / Go! 1.) ... Start Windows Fax and Scan! 2.) ... Problems with Fax and Scan on Windows-10! 3.) ... 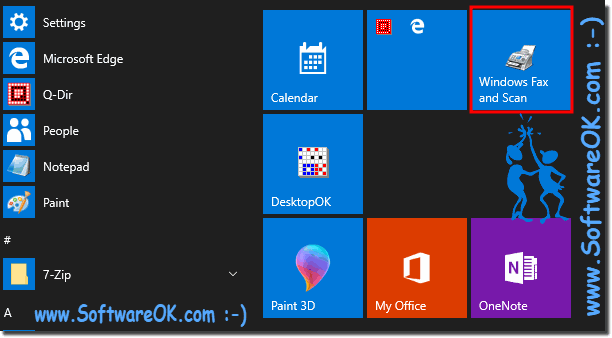 Create WFS shortcut on the Windows 10 desktop! 4.) ... Keyboard shortcut for Fax and Scan for Win-10! 5.) ... Start Fax and Scan automatically at Login or Windows Start! 6.) ... Pin Windows Fax and Scan on Start for Tablet Mode ie for MS Surface Pro! 1.) Start Windows Fax and Scan! Start the Windows 10 run dialog and simply type the WFS command, this will start the Windows 10 fax and scan software. 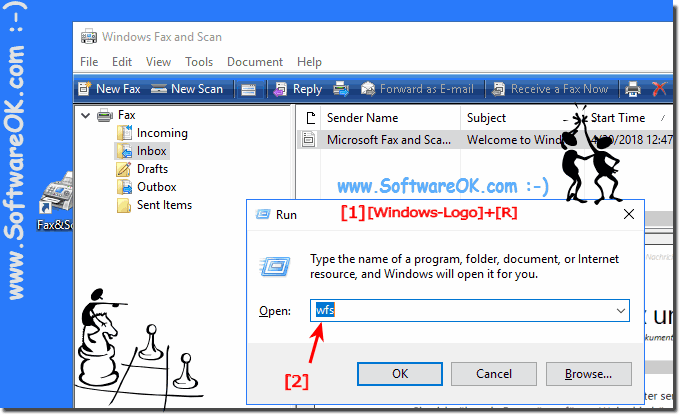 (Image-1) Windows 10 fax and scan software! You can crop an image before scanning it by clicking Preview in the New Scan dialog box. In the preview area, drag the handles of the cropping tool to resize the image. Some scanners can save individual documents or photos placed on the scanner bed as separate files on Windows 10. If your scanner has that capability, you can select the Preview or scan images as separate files check box. If your scanner doesn't have the capability, this option will be unavailable. Scanned documents and photos in Windows 10 are stored in the Documents folder under Scanned Documents. If you create a new folder in the Windows 10 Scanned Documents folder, it won't appear in the Scan view until you close and reopen Windows Fax and Scan, or collapse and then expand the list of folders. To change the default file name for a scanned document or photo, right-click the file name in the Scan view, and then click Rename. To organize your scanned documents or photos on Windows 10, right-click the Scan folder in the left pane, and then click New Folder. To move a scanned document or photo to a folder, right-click the document, click Move to Folder, and then select the destination on Windows 10 OS. You can automatically forward scanned documents to an e‑mail address or a Windows 10 network folder. To choose a forwarding option, click the Tools menu, and then click Scan Routing. Select your preferred option, enter the details, and then click Save on you Windows 10 PC. 2.) Problems with Fax and Scan on Windows-10! The Solution: ... Fax and Scan is gone at once, Windows (10, 8.1)! 3.) 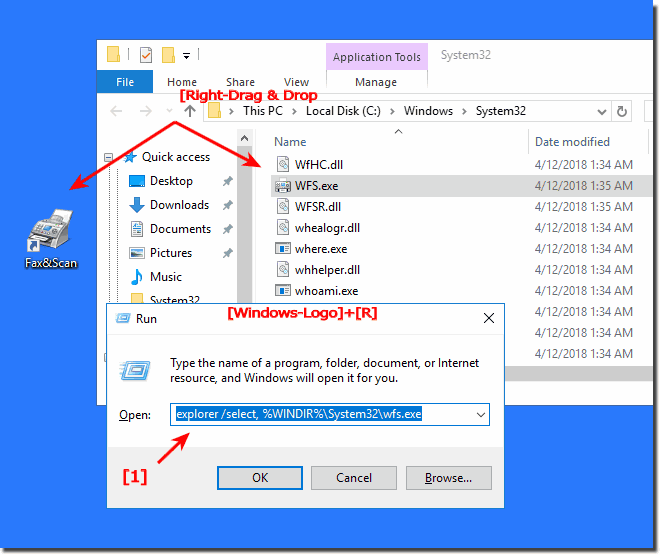 Create WFS shortcut on the Windows 10 desktop! This command will auto select the wfs.exe in C:\Windows\System32\ folder. And now simply use Right Mouse Drag&Drop and rename the Desktop Shortcut for example to Fax&Scan on your Windows 10 Desktop. You can also run The MS-Explorer Windows-Logo + E and Browse to C:\Windows\System32\ scroll down to Fax and Scan and select the wfs.exe File. (Image-2) Start Fax and Scan function from Windows-Desktop! 4.) 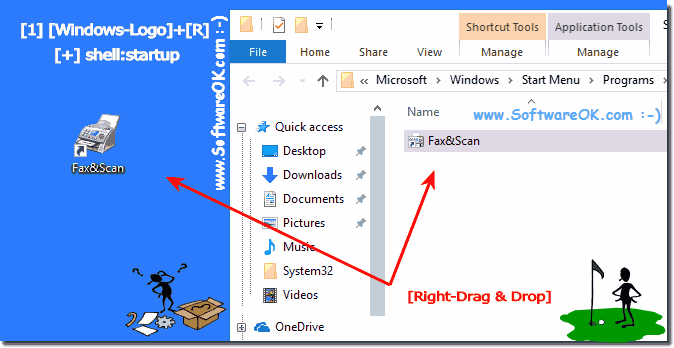 Keyboard shortcut for Fax and Scan for Win-10! A keyboard shortcut is also handy to start the fax and scan program. You can also start it from the Run dialog, but a direct keyboard shortcut will favor some Windows users because it's handy. (Image-3) Keyboardshortcut for fax and scan! 5.) 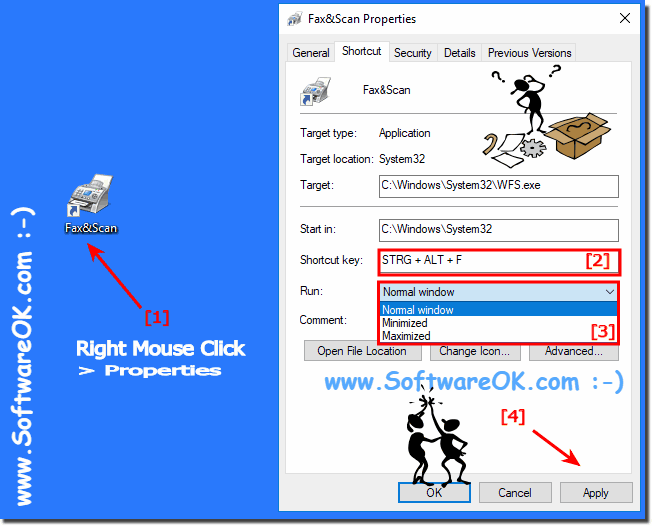 Windows Fax and Scan automatically at Login or Windows Start! If you would like to add Windows Fax and Scan to your own login, please use the shell:startup directory and if you want Windows Fax and Scanning to start when Windows starts 10, for all users shell:common startup folder. If you created the desktop shortcut for WFS, you can copy it directly to the Auto-Start folder. If you do not need the WFS desktop shortcut, just delete it afterwards. Siehe auch: ►►► ... Small Symbols in Task-Bar Windows 10! (Image-4) Help Windows 10 has no fax and scan function, where is it? 6.) Pin Windows Fax and Scan on Start for Tablet Mode ie for MS Surface Pro! If you have created the desktop shortcut for the WFS, do a Mouse Right Click and Pin Windows Fax and Scan on Start for Tablet Mode ie for MS Surface Pro! (Image-5) Pin on Start The Fax and Scan feature! (Image-6) Pin Windows Fax and Scan on Start 4 Tablet-Mode! As you can see above in Windows 10 shot screenshot, there is no great art to scan or fax under Windows You can easily apply this example as a solution on earlier versions of Microsoft Windows operating systems, whether it is a Windows Desktop Computer, or Mobile Tablet PC, Surface Pro / Go, or even a server operating system. See also: ►►► Hidden files and folders! Windows-10 - FAQ-64: Help Windows 10 has no fax and scan function, where is it?